Step through the gate into a world of your own. Minutes from the Pacific coast, shops, restaurants, galleries, and cafes. 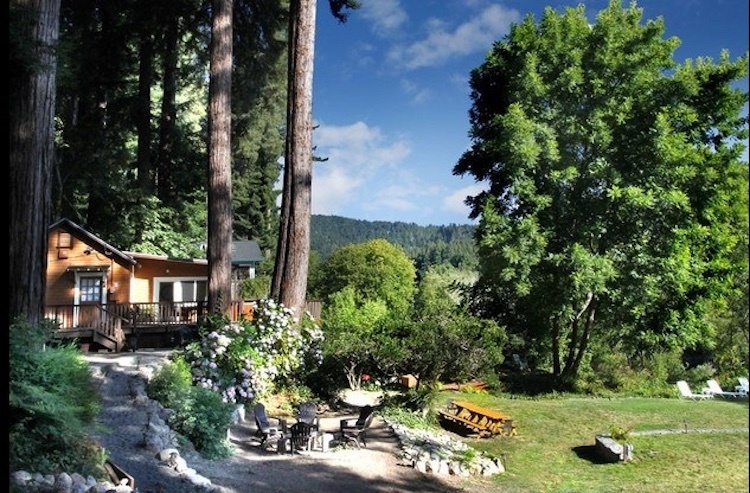 In an area known for wonderful hiking trails, cycling routes and kayaking, this is the Russian River vacation rental you’ve been looking for! Arriving at Riverwood Cottage, you will find a cozy, two-bedroom, two-bath home with large grounds running right to the river. The living room is equipped with a comfy couch, a gas fireplace and a wall-mounted TV with cable. Sliding glass doors lead to an expansive, wrap-around deck with a dining table for six. 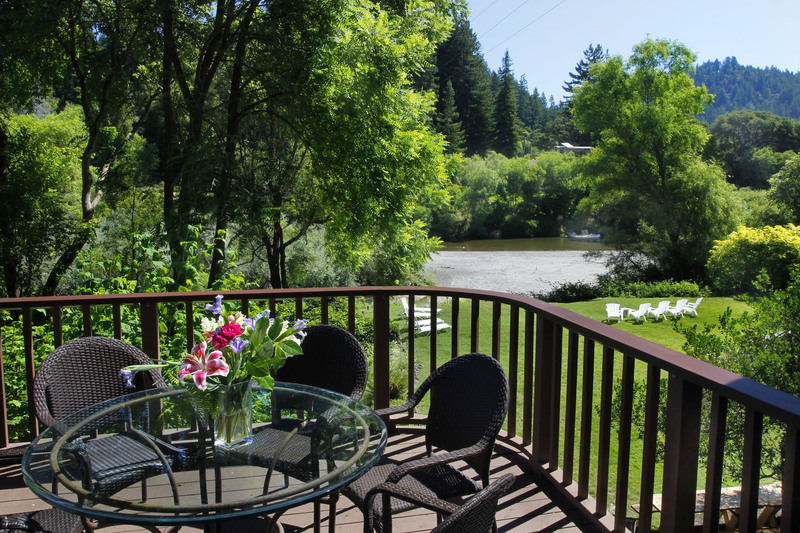 The deck has numerous other seating areas and nooks for you to enjoy the sights and sounds of the Russian River flora and fauna. The kitchen is stocked with all the pots, pans and accessories you need to create a home-cooked meal. There’s a friendly grocery store approximately a quarter-mile away that’s perfect for grabbing any items you forgot. You can also find a Safeway store in Guerneville, a 10 minute drive away. Don’t feel like cooking inside? BBQ on the Weber and dine on the lawn or the deck. There’s a prep sink and bar area on the lower level, accessible from the yard. One of the bathrooms is on this level as well. Enjoy a cool drink while you watch the children play. The lower shower is ideal for rinsing off after a hot day or washing the river off the dogs! Once you’ve snacked and soaked up the sun, it’s time to wind down. Head onto the deck and soak in the hot tub while the stars come out overhead. 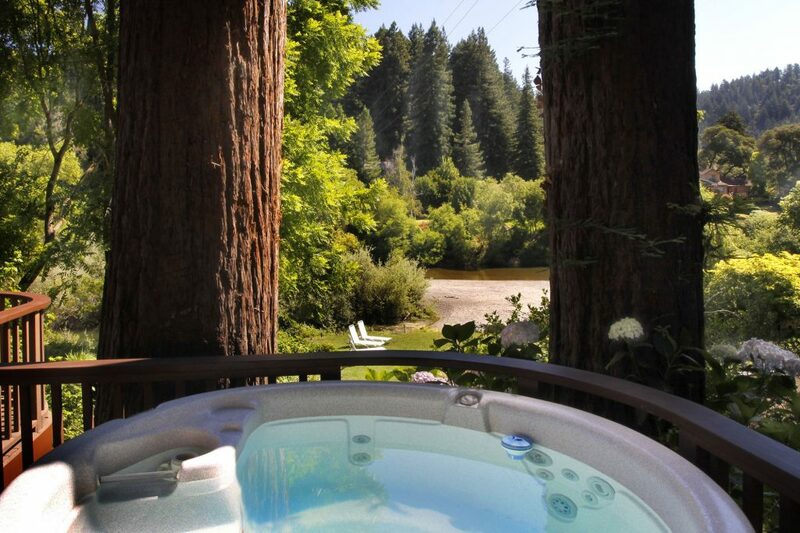 The hot tub is on the deck, surrounded by redwood trees with a view of the river. Gather the family around the fire pit, tell stories, make S’mores and enjoy your time together. When it’s finally time for bed, you’ll sleep well on the lush pillow-top mattresses. Each bedroom has a queen-sized bed stocked with soft, down comforters. The upper bathroom has a claw-foot bathtub complimented by plush towels and rugs for your comfort. Maybe someone in your group prefers to have their recreation on terra firma. Tennis anyone? The Monte Rio Tennis and Basketball Courts are a ten minute walk away. In the same center you’ll also find a skatepark for the kids. Or, drive five minutes to the Northwood Golf Club where you can golf on a 9-hole course designed by Dr. Alister MacKenzie, of Augusta National and Cypress Point fame. Want to see more pictures? Take a look at our Photo Gallery!